My maternal grandparents, Simon and Sophia Ettinger, were homesteaders in the Territory of North Dakota in the late 1880’s. I have gathered this story as best I could from copies of official documents, news stories about the place and era and, of course, my family’s own oral history. There are some blanks that we need to fill in by induction, but then, this all happened roughly 120 years ago. Simon and Sophie, together with their 3 daughters (Lena, Fanny and Stella) left their home_in or near Odessa, Russia, and emigrated to the United States in 1881. They arrived in Chicago in June of that year. Simon was 28 years old at that time, and Sophie would have been 27. Their 4th child, Irving, was born on the boat, but in American waters, thus becoming the first United States citizen in the Ettinger family. My mother, Anna, was born on February 11, 1884. By that time, though, the family – or at least my grandfather – had moved again, this time to St. Paul, Minnesota. Records that my cousin Hal Ettinger obtained from the Minnesota Historical Society show that Simon Ettinger filed a declaration of his intention to become a United States citizen on October 25, 1883. I have a copy of that declaration, and it was filed with the court in Ramsey County (St. Paul) Minnesota. City directories for the years 1884 through 1886 show that the Ettinger family resided on Texas Street in St. Paul. Simon was as a peddler. The St. Paul census, dated May 8, 1885, lists 8 members of the Ettinger household, including my mother, but the names and ages that are shown suggest that there were some errors in the data. In any event, we know that the family was there at that time and that my mother was among them. And judging from the names near theirs in the census list, and the birthplaces that are shown, they must have lived in a Jewish neighborhood, with many other Russian immigrants. Peddling was a common enough occupation for Jewish immigrants in that era, and for some, it led to success as merchants, retailers or bankers.But for most, including Simon, that must not have been so. For Simon and a surprising number of other Eastern­ European Jews, America’s promise lay in literally greener pastures – free (or nearly free) land, available · from the government and suitable for farming. The St. Paul city directory still lists Simon and his family in 1886, but by the fall of that year he had voted in a different Ramsey County – this one by the town of Devils Lake in the Dakota Territory (now, North Dakota). He apparently also filed a homestead “pre-emption” claim for several lots of farm land in Devils Lake in the fall of 1886. By 1887, he had built a house on that land, and the family had moved there. On April 7, 1887, Simon filed a homestead application for an additional lot on a section of land adjacent to his initial tract. A year and a half later on October 8, 1888 – he filed a proof of claim relating to that application. I have a copy of that proof of claim, and it tells us a lot about the life that the Ettinger family lived on that land in those years. It was not easy. In his 1888 proof of claim, Simon says that he and his family had moved onto the homestead claim land in March 1887 and that they had lived on and farmed that land since that time. The land itself was 40 acres of “clear prairie farming land,” valuable for farming but not for timber or mining, and it was not used for grazing. Their only absence from this lot, he said, was between December, 1887 and March 1888, when they lived on the adjoining land that was covered by his earlier preemption claim “for the reason thatI had more comfortable house there.” It may have been “more comfortable,” but it most certainly would not have been luxurious. Simon’s proof of claim explains that he built a house on the homestead land and that it was valued at $75. The house was 12 feet by 16 feet. It was made of lumber with a shingle roof. It had a window, a door and a floor (as opposed to just dirt). He notes that he lived there with Sophie and their (by then) 7 children. His proof of claim states that he had no other personal property, either on the homestead or elsewhere. So the furniture must have been brought from that “more comfortable” house on the pre­ emption land. We do not think of farming as a Jewish occupation – what Jewish mother dreams of sending her son off to agricultural school? But Simon and Sophie were from a part of Russia that abounded in · wheat fields, and it must have seemed a natural thing to do – a great opportunity. However, even though they had lived several years in St. Paul, they must not have been prepared for North Dakota winters. Simon’s 1888 proof of claim reports that he had farmed his homestead land for one season. He had planted 12 acres of wheat, but all of it was frozen. Undaunted, though, he had 12 acres ready for crop the next season – which would have been 1889. We don’t know what happened to that crop. But we know the family did not avoid misfortune. Simon died on August 28, 1889. Family legend has it that he was buried in a snowstorm. Perhaps, but even in North Dakota, August seems a little early for a snow storm quite that deep. He may well have been caught in an early storm, though, and died of the consequences. He is buried in Devils Lake. A stone, carved to say “S. Ettinger, died August the 28” marks his grave in what is known locally as the Jewish or “Sons of Jacob” cemetery in Devils Lake. The cemetery originated in 1885, when the 19 month old son of Mr. & Mrs. Herman Kauffman was buried there. One of the Kauffman daughters eventually moved to New York and married Adolf Zukor, an early motion picture magnate. A biography about Zukor recounts the Kauffman family’s life in Devils Lake. They arrived just a few years before my grandfather, but their experiences must not have been very different. 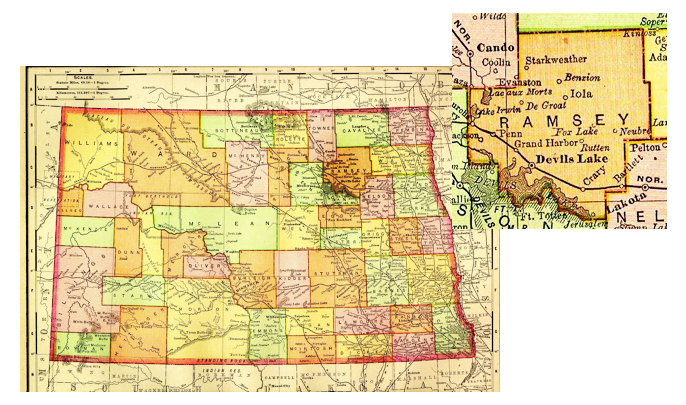 The biography tells of a Kauffman relative, Morris Kohn, seeing a sign in a shop window in Chicago that told of “great possibilities and bumper crops” in the Dakota Territory. So, in 1884, the Kohns and Kauffmans loaded themselves and their belongings onto a box car and traveled by rail from Chicago to Devils Lake. killing it all. This was pretty much the same as my grandfather’s experience a few years later, not only with his 1888 wheat crop but perhaps also with an 1889 storm that caused his death. Before Simon died, he had transferred the homestead property over to Sophie, apparently in consideration of $2,000. At least that is what the deed, dated May 6, 1889, recites. We don’t know why he did that, but it likely had to do with obtaining a mortgage loan for the $2,000. After Simon’s death, Sophie and the family returned to Chicago, and in 1892 she sold the homestead property to a man named Charles Budde of Devils Lake. The nominal sales price was $10, but Mr. Budde took the property subject to both a mortgage and some tax liens. Sophie could not support her large family, and in 1894 the younger ones, including my mother, were sent to an orphanage – the Jewish Children’s Home in Cleveland, Ohio. They stayed there until they were confirmed at age 14, when they were sent home. She died in 1920. The oldest girl, Lena, married Meyer Dedek of Chicago, moved to Washington, and became a member of Washington Hebrew at the turn of the 20th century. My uncles always resented their time in the orphanage, but my mother was grateful for the education she received. She was bright, talented and artistic. Apparently, the school master recognized her abilities and helped her. She learned to love poetry and art, and she learned Hebrew. When she returned to Chicago and started to work, she took art lessons ·· and learned to paint porcelains. I have several of her beautiful pieces, which I treasure. I have always been very proud of her. Like many of you who moved here from further north, I sometimes laugh when Washingtonians complain about the cold and snow in winter. I’m from Chicago, I say, and I know about cold and snow. But my mother and my grandparents really knew – they· spent four winters homesteading in North Dakota in a 12-by-16 house. At least they had a stove.